Licenses, Cables, Battery Plates, etc. From portable camera-top encoders to rack-mount and high density configurations, Teradek HEVC and H.264 codecs offer unparalleled image quality for any IP video application. All Teradek codecs can stream to any online video platform, including Facebook Live, YouTube Live, Periscope, Twitch, and more. Go live on multiple platforms at the same time to increase viewership and engagement with our Core platform. Cube, Slice, and T-Rax codecs are cross compatible and offer streaming latency as low as 100ms on local networks or over the Internet. * For complex, real-time IP video routing, our Core platforms allows you to transmit feeds from Teradek encoders to any other decoder around the world. *Latency dependent on network traffic and health. Teradek is a proud member of the Secure Reliable Transport (SRT) Alliance. By choosing to stream with SRT on Cube, Slice, or T-Rax, you can deliver high quality, low latency video over the Internet, even during periods of severe network congestion. Cube packs world-class video quality into a rugged, portable chassis for quick IP video deployments at any location. Each encoder and decoder includes HDMI and 3G-SDI I/O, Ethernet / WiFI connectivity, and full duplex IFB. Built on the award-winning Cube platform, Slice is a rack mount HEVC / H.264 codec designed to fit seamlessly into your broadcast studio. 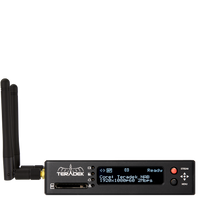 Like the Cube, Slice encoders and decoders includes 3G-SDI and HDMI I/O, Ethernet and WiFi connectivity, and full duplex IFB. For high density applications, T-Rax offers room for up to 8 HEVC / H.264 encoder or decoder cards in a 2RU chassis. Each codec is built on the Cube platform, which offers support for EIA-608 and EIA-708 closed-captioning, 3G-SDI I/O, and comprehensive protocol capabilities: SRT, MPEG-TS, RTMP, RTSP/RTP. Stream to Facebook, YouTube, and any other video platform. Core allows you to publish a single video feed to multiple destinations all at the same time. Being on the cutting edge means everybody else has to catch up, but not with Core’s Transcoding engine. Stream from your HEVC Teradek encoder to Core for a real-time conversion to AVC, allowing you to take advantage of H.265’s benefits while delivering your content in the common H.264 standard. Remotely configure every parameter of your Teradek codecs or route them to any compatible H.264 decoder, all from your web browser. Core allows encoders and decoders to pass through firewalls without any additional configuration required. Record and monitor every video feed passing through Core in real-time. Each file is automatically saved on Amazon’s S3 servers, which means they’re accessible from anywhere with an Internet connection. Access all of Core’s features directly from your iOS device. The Core App allows you to route, monitor and publish your streams all with the portability and convenience of a phone or tablet. Bond expands the award-winning Cube encoder’s transmission capabilities to create a state of the art cellular broadcast solution that helps you to go live from mission critical news events to your school’s football games. The Bond Backpack is an all in one professional HEVC/H.264 streaming solution for broadcasters seeking the best in signal reception and video quality. The Bond expansion module seamlessly connects to any Cube 600, 700, or 800 series through a pogo pin connector. Once connected, the module offers up to 4 additional modem connections via USB or 4-pin connector. A built-in 5 minute Li-Ion offers continuous power during battery swaps. Node is a high performance 3G / 4G / LTE modem that provides exceptional connectivity and weather resistance. The modem connects to Bond via your choice of USB or 4-pin connector, with the latter offering superior coupling to the chassis. Teralink allows Cube to combine up to 4x iPhone 4G/LTE networks into a single, robust Internet connection for streaming. Simply download the Teralink app, connect your iPhone to Cube’s access point, and you’re ready to go. Live:Air Action is a free video switching iOS app that transforms your live stream into a complete multi-camera live production with custom graphics, texts, transitions and much more. Cube allows you to use an SDI or HDMI video source as an input in Live:Air Action. Switch between multiple camera sources connected to Teradek encoders or iOS devices with Live:Air Remote installed and stream to any major live platform all from the app. Features like lower-thirds, scoreboards, images and pre-recorded videos can all be added using Live:Air Action’s intuitive control surface, with clips directly recorded to your iPad’s camera roll.